Does anyone know the status of the 'interactive diagram' page in XOT 2.1? I see a posting in 2013 saying it had been retired, but another later saying it was converted to HTML5 but won't properly work in IE (it doesn't). Will this be overcome for IE? I'm testing in Chrome but stuck on an issue in which my 'hot spots' show as black in the interaction, so you can't see what they are covering on the image behind them. I can't see a way around this...anyone know what I'm doing wrong? 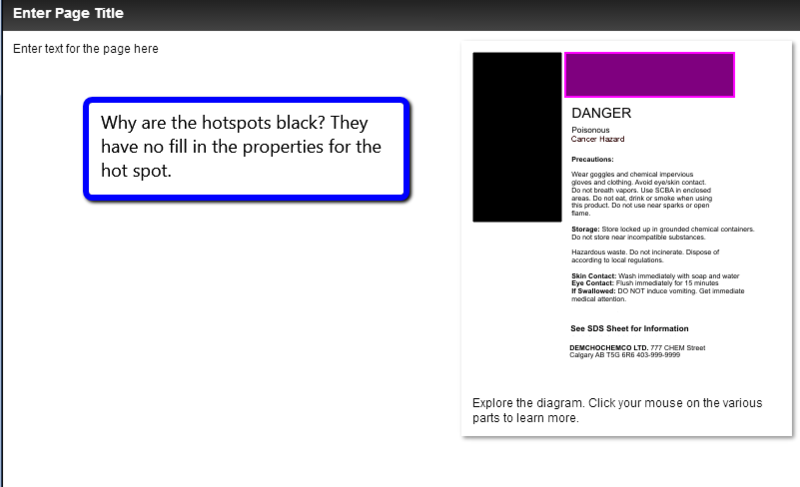 The 'fill' for the hotspots are set to 'no fill', but instead this displays as black. Any documentation anywhere for this page? It is obviously very capable (clicking the 'show language options' checkbox displays many options) but very difficult to figure out...thanks to Ron Mitchell I've found how to set the hotspot text in the image editor 'properties' which works fine.. just stuck on why these hot spots show as opaque black.